Valley Power has partnered with Blue Star Power Systems to offer a comprehensive portfolio of products to serve all major markets within the power generation industry. 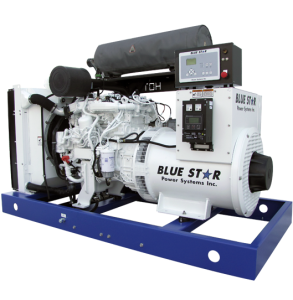 Blue Star’s product offering includes diesel generator sets with power ranges from 20-2000 kW and gaseous generator sets from 20-650 kW. From the standard product line to customized packages, Blue Star’s quality and attention to detail is unparalleled. We offer customized solutions that give you the unique opportunity to receive a unit that is suited perfectly to you or your customer’s particular application. Whether your need is continuous power, the ability to cover peak loads, or simply peace of mind with back-up emergency power, our goal is to develop a long term partnership well beyond the sale with service and preventative maintenance programs. Blue Star’s gaseous generator sets range in power from 20-650 kW for special applications that require gaseous options because of local fuel codes, containment, or customer preferences are available in natural gas, propane (20-400 kW), and combined fuel options. Blue Star offers EPA Tier 4 Final compliant diesel generator sets ranging from 30-2500 kWe. From prime power to peak shaving applications, in both stationary and mobile versions, our Tier 4 Final units meet all Federal, State and local emissions regulations that require certified Tier 4 Final engines. The use of SCR technology has allowed Blue Star to eliminate DPF regeneration cycles, resulting in reduced down-time and maintenance of the exhaust after treatment system. This combined with Valley Power’s commitment to our customers result in improved fuel efficiency and maximized performance while minimizing operating costs. Blue Star’s commitment to fuel efficiency, and current EPA emissions standards provide you with the most technologically advanced, environmentally friendly unit available. All units are UL 2200 Listed, CSA and seismic certified to IBC 2012.